I now have a wide range of Glitter Tattoos, from Butterflies or Princesses to Skulls and Tribal. 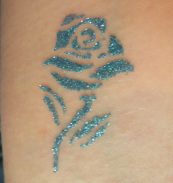 I can also do Glitter Tattoo parties which are definately a hit with older children and adults alike. Recommended age is from 4 upwards.